Service workers will likely have fewer safe, affordable ways to get home after late shifts. Vee Tucker, a bartender and banquet server in Washington, D.C., doesn’t know how she’s going to get home from work anymore. Starting this summer, the train she takes home to suburban Maryland, along with all other D.C. Metrorail lines, will be closed by the time she has cleaned up after her patrons, just before midnight. Fortunately for Tucker, a coworker volunteered to pay for a Lyft—an option she knows is not sustainable long-term. She dismisses the idea of taking the bus, saying it would take two and a half hours and several bus transfers, during which she would have to stand outside by herself in parts of town she feels are unsafe. Service workers are likely to face some of the worst effects of the Metro Board’s decision last Thursday to slash late-night rail service system-wide for two years in order to tackle the rail system’s immense maintenance backlog. Under the new schedule, rail service will be cut off at 11:30 p.m. from Monday to Thursday nights, 1 a.m. Friday and Saturday nights, and 11 p.m. Sunday nights— a significant cutback from the traditional weekday midnight closings and 3 a.m. weekend closings that were in place until a maintenance push began in June. 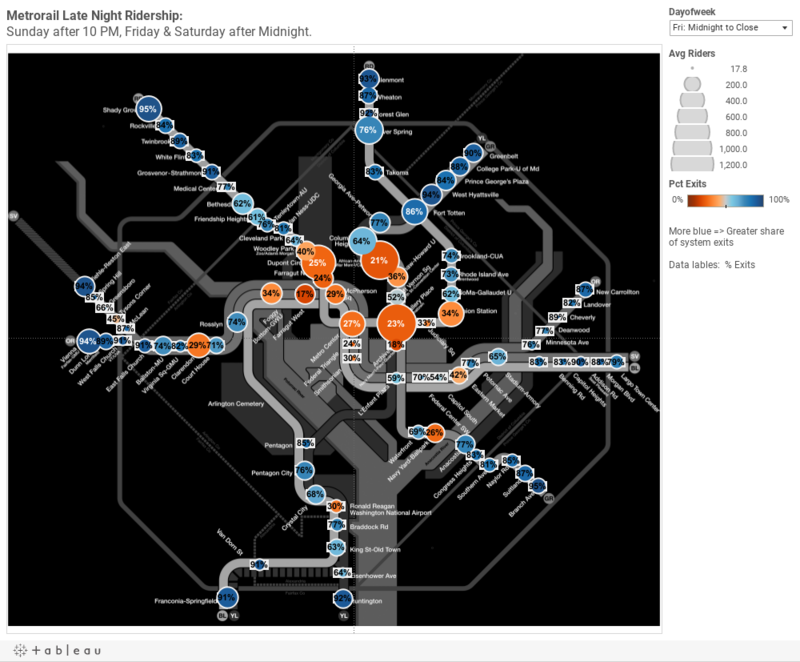 To visualize the challenges these workers will face, CityLab mapped out WMATA data on after-midnight ridership, alongside Census data on the geographic distribution of D.C. area service workers who use public transportation. In the first map below, you can see where most people are boarding Metro during late-night hours, based on WMATA’s weekly weekend ridership averages from September 2010 to February 2016. The bigger, darker dots indicate where more commuters are leaving from after midnight. Zoom in around the map to see more stations and click on each stop to see weekly averages of late-night riders entering these stations. Unsurprisingly, neighborhoods with lots of clubs, bars, and restaurants, such as U Street, Dupont Circle, and Chinatown, averaged the most riders entrants during this period, reflecting both the workers and patrons going home late at night. Focusing on the considerable distances between where most late-night riders start their trips, and the communities where service workers tend to cluster, we can infer the distances many service workers have to travel after work, and the resulting difficulties that may arise from late-night service cuts. As can be seen in the map above, most service workers, unable to afford rent in neighborhoods near the center of the city, cluster at the far edges of or beyond the District’s eastern quadrants, especially concentrated along the Metro lines that run east into Prince George’s County and north into Montgomery County. You can see this by zooming out and looking farther eastward on the map. Service workers tend to live farther out in and beyond the District, suggesting they may have a harder time getting home after the rail service cuts. WMATA spokesman Richard Jordan says the late-night closures are necessary system-wide to give crews more time to do uninterrupted maintenance work. When WMATA first proposed shorter operating hours in October, the agency said it had just 33 train-free hours each week to perform repairs on the aging system, and it put forward four proposals, including the one it adopted last week, to get that number up to 41 hours per week. Paul Lewis, vice president of policy and finance at the Eno Center for Transportation, says that WMATA’s responsibility to ensure safety is paramount, but points out that the system-wide nature of the service cuts is also due, in part, to convenience for WMATA. Neil Albert, executive director of the Downtown D.C. Business Improvement District, argues that other major urban metro systems with similar track designs have been able to carry out maintenance while offering round-the-clock service. “The general manager of WMATA got here a year ago, and he doesn’t have a sense of what WMATA means for D.C., and downtown in particular,” says Albert, citing the damaging effects the cuts will have on businesses downtown and the workers and patrons who make them thrive. “WMATA is not going to work on the entire system across the board every night. They should take a more targeted, less disruptive approach.” Albert suggests that if the system-wide cuts are indeed necessary, WMATA must create dedicated bus routes along the affected rail routes, running as frequently as possible. Jordan, the WMATA spokesperson, did not go into specifics on what WMATA is planning to do to address the damage done by the service cuts. “There’s room for further adjustments down the road,” Jordan says. “We look at bus alterations at least twice a year. Sometimes we look at certain routes, sometimes we cut, merge routes for efficiency depending on ridership.” WMATA’s website includes a proposed supplemental bus service plan, but some transit advocates fear it will not be anywhere near the scale of what is necessary.